Once upon a time you might’ve been forgiven for not knowing Harshdeep Kaur. Having worked as a playback singer on famous Bollywood songs, you’d have recognised the voice but not the face. 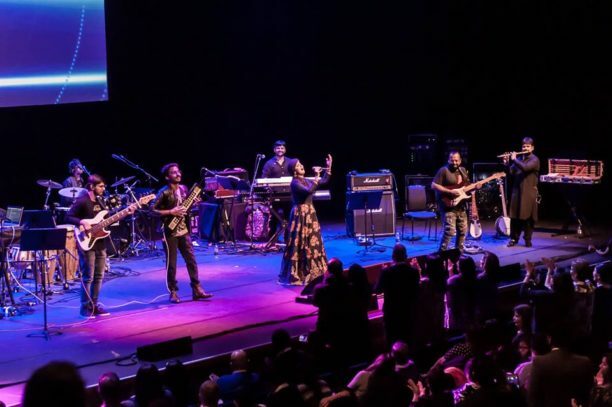 However, since winning two talent reality shows and appearing in all four seasons of Coke Studio in India, she is recognisable in her own right these days. Arguably, she’s the most popular Sufi and Punjabi folk artist in Bollywood. Excitingly that success has gone on to fuel Harshdeep’s first solo tour of the UK and what a treat for those lucky enough to be at the Barbican Centre in London on 27th March. The location for the concert was significant and someone somewhere made a good choice. Yes, I’ve been impressed by A.R. Rahman filling up the Wembley Arena but having Harshdeep Kaur perform in the Hall at the Barbican led to a much more personal experience, having just under 2,000 seats rather than over 12,000. It played to her strengths, her voice and her ability to engage the audience. The seven-piece band all showed great skill and the comparatively small venue meant that the use of amplification felt quite subtle, avoiding the need to compromise the quality of the music in the way that big arenas and stadiums can suffer from. 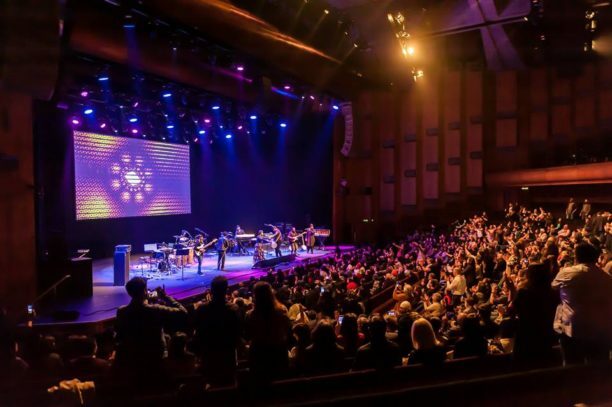 It was clear from the outset that a good proportion of the audience knew what they were expecting, with a large round of applause as Harshdeep took to the stage. Although there had been some technical problems that delayed the start of the concert, so there might have been some relief that things were finally underway. She began with a small speech, demonstrating a confidence with the crowd. Throughout the evening she would share little stories about her inspirations and anecdotes from her childhood, growing up in a family that was in the music industry, her life story, including moments where she had the chance to meet or sing with artists she greatly respected. She told us that we were a wonderful audience several times during the evening and her engaging personality made it impossible not to like her. Despite her great talent you still felt she was humble and grounded. The pace began quite slowly, focussing on Sufi and Punjabi folk songs. She started the concert with a cleverly chosen Gurbani ‘Ik Onkar’ (Rang de Basanti) – that touched the sensibilities of the Punjabi audience that were clearly the majority that night. It was with ‘Allah Hu’ – her “trump card” for winning in reality shows that the audience really began to warm up and join in, with everyone clapping along and from that point on the whole auditorium was swept along from one song to the next. The first half of the show had a few of her Bollywood hits. There were the big name songs you might expect from her playback work, tracks where you would recognise the movie as much as the music, such as ‘Ik Onkar’ (Rang de Basanti), ‘Jugni ji’ (Cocktail), and ‘Zaalima’ (Raees). She paid homage to A.R. Rahman for her success in Bollywood by performing ‘Heer’ (Jab Tak Hai Jaan), a track he wrote for the movie that became a big hit for her. But she stayed focussed on her Sufi and Punjabi folk music. 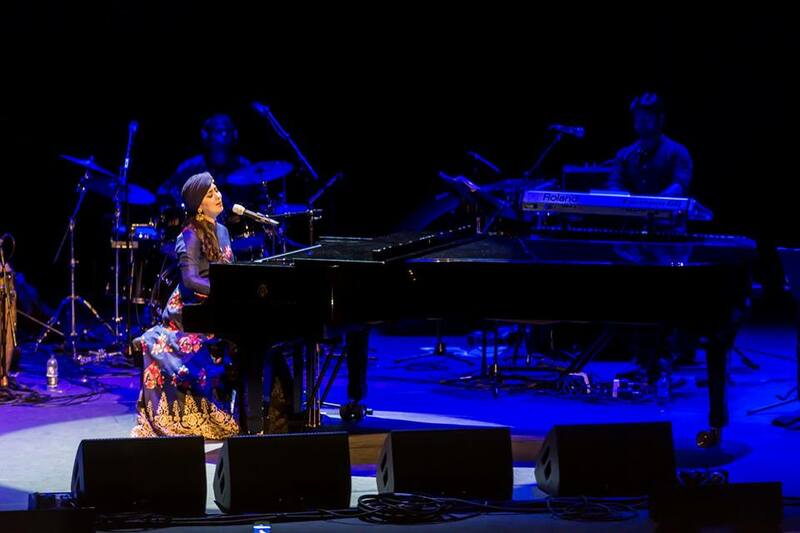 After the interval, a grand piano was wheeled out and Harshdeep got to really show off her vocal prowess with an unplugged session. 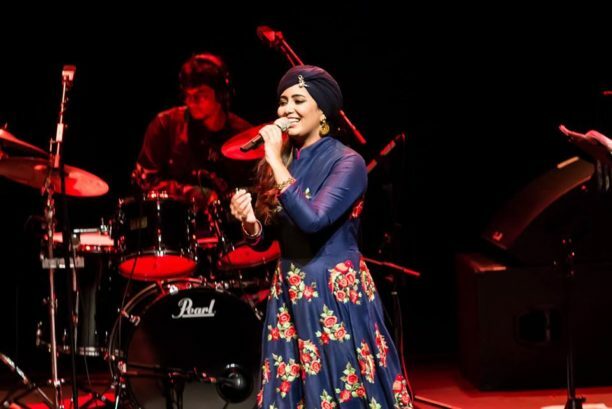 She chose her favourite songs, starting with Farida Khanum’s ‘Aaj Jane Ki Zid Na Karo’ and her favourite numbers by legendary Punjabi artists, and her inspirations Surinder Kaur and Jagjit Singh. The audience was enraptured by her, but there was no denying the increase in the energy when the large keyboard was taken off and the band joined her once again. The musicians, clearly loving what they were playing and jamming together, got to show off with each instrument given some solo time. Each player parading their skills, especially as the show moved towards its conclusion. The songs became bigger and the band more energised. Every song felt like it must’ve been the finale, but no, the atmosphere just kept getting more electric. Finally, when she said that this was indeed the finale there was a mix of emotions, sad that the show was coming to an end but joy that it had been so impressive. The crowd was mostly on its feet, jumping around and clapping, relishing the uplifting music. Even with a running time of over three hours, there was a feeling that the concert could have run all night. Harshdeep admitted that she’d had to drop a few songs to keep to a sensible end time. Despite that, there was an encore and the audience was still keen to have more. I think Harshdeep will have no trouble in selling out another concert when she visits London again. Perhaps the most powerful effect of the evening, beyond the music and her amazing voice, was the way that Harshdeep managed to keep the show feeling personal. Each audience member was made to feel welcome and valued. Whether it was with a song dedicated to the unmarried women in the audience, wishing them luck in finding the man of their dreams, or her heartfelt wishes that children should be listening to music that has meaning, or that humanity and love should be the only religion. It was hard to feel anything but admiration and appreciation for her. Here’s hoping it’s not too long before there are further Harshdeep concerts in the UK. The Barbican proved that’s definitely the appetite for more, much more.